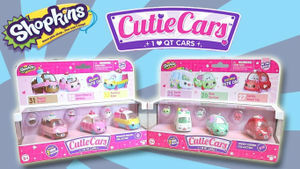 Where can I buy the Shopkins Cutie Cars 3 Packs? Use this free stock checker to find out where you can buy the different Shopkins Cutie Cars 3 Packs, and get FREE email stock alerts. These are super hot toys for Christmas 2017. Kids just love collecting, swapping and trading collectibles. There are four different Shopkins Cutie Cars 3 Packs to choose from: The Fast n Fruity 3 pack, Candy Combo 3 pack, Freezy Riders 3 pack and the Bumper Bakery 3 pack. Each Cutie Car matches its Mini Shopkin. Simply lift the removable roof, put your mini Shopkin in the Cutie Car, place the roof back on and take your mini Shopkins for a ride! Cutie Cars are packed with personality and made with real die cast metal giving them weight like classic collectible cars.